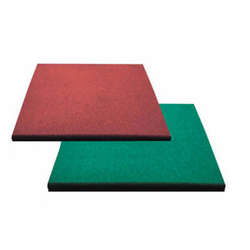 Offering you a complete choice of products which include play mat for children play area, rubber floor coverings, rubber flooring for playground equipment and outdoor play mats. Owing to our expertise in this domain, we are offering our clients a qualitative assortment of Play mat for Children Play Area. Our offered playmates are designed utilizing cutting edge techniques & finest material in accordance with the quality norms. After use, the mat can be neatly folded and packed away. It's also machine washable - so no maintenance problems. We are a manufacturer of Rubber Floor Coverings in Ahmedabad, Gujarat. We obligated to meet the quality standards as per the customer demand. Thickness 20 Inches x 20 Incches x 8 mm. 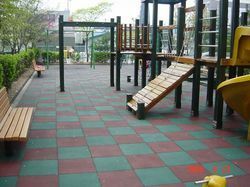 With years of experience in this domain, we have carved a niche by offering a commendable collection of Rubber Flooring for Playground Equipment. Our given rubber floorings are used in different industries and companies to ensure a non-slippery flooring. Our dexterous professionals design and manufacture this flooring with the utilization of excellent quality raw materials and the sophisticated methods. Our patrons can benefit these rubber floorings at affordable rates. Backed by rich industry experience and domain expertise, we are involved in manufacturing and supplying Outdoor Play Mats. These are obtainable in vivid colors and soft textures, our array of play mats can be designed using carpet shampoo even without harming the prints and colors of the mats. We offer these play mats in several customized options according to our customer’s request. These play mats are check on several parameters of quality in order to ensure their flawlessness from our side.